The 2011 edition of Economic Freedom of the World, published by Canada’s Fraser Institute (with help from groups like Cato), has been released. Covering data through 2009, the new report provides damning evidence of the negative impact of the Bush-Obama policies of bigger government and more intervention. Here’s a relevant passage from the Executive Summary. 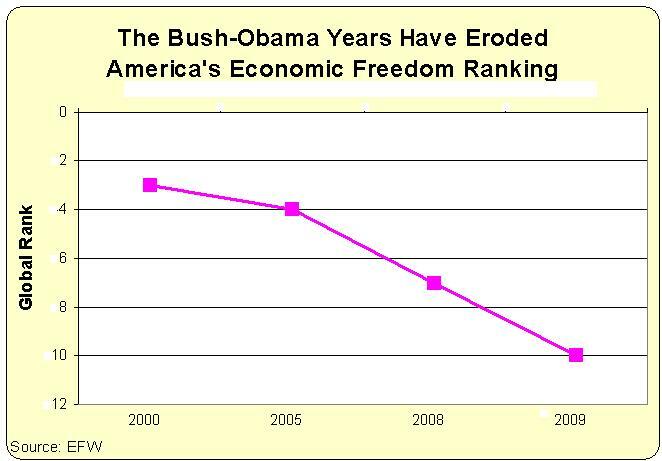 The world’s largest economy, the United States, has suffered one of the largest declines in economic freedom over the last 10 years, pushing it into tenth place. Much of this decline is a result of higher government spending and borrowing and lower scores for the legal structure and property rights components. 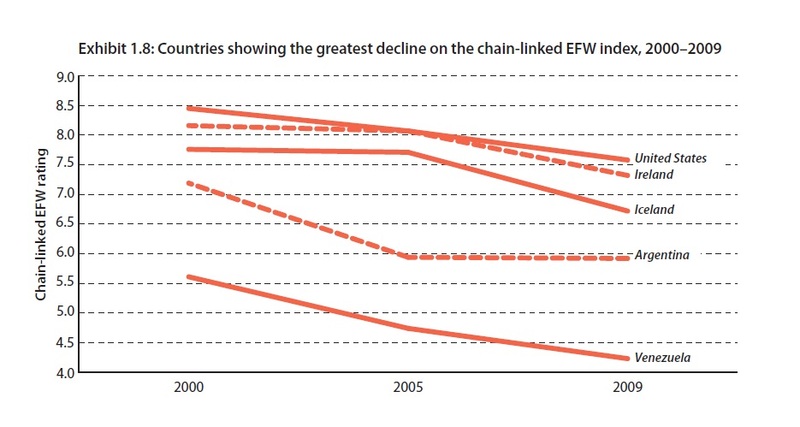 Over the longer term, the summary chain-linked ratings of Venezuela, Zimbabwe, United States, and Malaysia fell by eight-tenths of a point or more between 1990 and 2009, causing their rankings to slip. This chart, taken directly from the book, shows how the United States has been of the world’s five-worst performers over the past decade, putting America in a very unfortunate category. The previous chart shows the decline in America’s absolute ranking. And here’s a chart I created showing how the United States has declined relative to other nations. Simply stated, America is on the verge of falling out of the top 10, after being the 3rd-freest economy in the world at the end of the Clinton Administration. By the way, Hong Kong and Singapore are the top two nations, where they’ve ranked for quite some time. Here is the full top-10 list. Amazing how Switzerland -the Helvetic Confederation-, the country where the people can limit the most the power of the political class, has the 4th place in economic freedom. In Switzerland almost any law can be voted by the people on referendum. The Swiss democracy started in 1291, I do not know about any regime that is that old. The Swiss stopped imperialisms like Napoleon´s and Hitler´s: Napoleon tried to establish the “Helvetian Republic” but he had to quit Switzerland who reinstated its confederation. Hitler never dared to attack Switzerland, the National SOCIALISTS knew that ultra democratic Switzerland was very hard to conquer. Switzerland also had a decentralized, direct democracy which could not be surrendered to a foreign enemy by a political elite. Some governments surrendered to Hitler without resistance based on the decision of a king or dictator; this was institutionally impossible in Switzerland. If an ordinary Swiss citizen was told that the Federal President–a relatively powerless official–had surrendered the country, the citizen might not even know the president’s name, and would have held any “surrender” order in contempt. Let it be remembered that Switzerland took in more Jewish refugees than the United States took in refugees of all kinds. Nr 1 and Nr 2 in freedom are Hong Kong and Singapore. Both are non-democracies (Singapore is authoritarian according to many). Non democracy is too dangerous, R.J. Rummel showed that democracies impede mass murder by governments and that democracies do not wage wars to each others proving that dictatorship is the cause of both war and mass murder by governments. Why are Taxes going Up on The Wealthy? They enabled the stripping out of the Best Performing Manufacturing for Export Sales from Our Nations Economy. 400,000 New Unemployed every 30 days for the past 3 consecutive Years with no end in sight.. If Our Military decided to move to another Nation because of a boost to their Stock Holdings .. thus jeopardizing the Nations Safety and Security ..
What would your Opinion BE? Fools in Congress who Legislated this Behavior to be Quasi Racketeering Legal? Have Any of You an Idea how to now Create a New Corporation to take the place of the Corporate Division you just handed off to the Communist Red Chinese Government? Blah_Blah Freedom of Trade ..
You Tell Me what YOU intend to do with 400,000 New Unemployed every 30 Days? They are Factory Workers .. with Families and Mortgages. Where in GOD’s Name do You Congress Clowns get off LEGALIZING THE STRIPPING OF OUR NATIONS ECONOMIC ENGINES OF HISTORIC PROSPERITY and HANDING THEM OFF TO COMMUNIST RED CHINA? racketeering Legislation which ties the USA into NAFTA_WTO which operates from a behind closed doors group of ‘investing advisers’. Clintons Economy ran not under operative NAFTA_WTO rules. G.W.Bushs Economy ran under NAFTA_WTO rules and Tanked Two Terms. Obama’s Economy suffers under NAFTA_WTO rules .. generating Zero Jobs and SOLYNDRA going bust because NAFTA_WTO choose where the Manufacturing will be located for Corporate Profits .. not .. National Wealth Generation by the Corporates Home Nation. What does America get for NAFTA_WTO losses of large Corporate Manufacturing .. the Wealth which Made America an Advanced Nation? A Token Sales Tax which goes to the Cayman Island Tax Avoidance Accounts legalized by Our Elected Congress for their Campaign Contributing Corporate Friends. Racketeering Legislation against the Economic Stability & Security of Our Nation? Entirely Stripped Out of Our Nations Economy Forever thanks to Congress. Making Legal to Gut the Nation of Entire Corporate Divisions and Hand them over to Communist Red China?